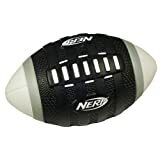 Show off the awesome power of your quarterbacking arm with the Aero Howler football. These are The Farthest Flying Footballs. The ball has a hand grip so you can target your passes better. Its long-distance tail sends it flying as far as you can fling it, and everyone will know you’ve heaved it because the ball howls as it flies. 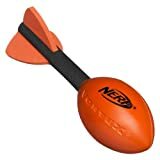 Go long with the Aero Howler football. Practice and play like the pros! Nerfoop is the ultimate basketball experience. 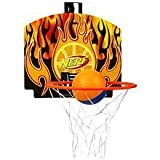 Thanks to a stylin’ backboard, tough hoop, net, and super-cool Nerf basketball, you can shoot and slam dunk like your favorite players. 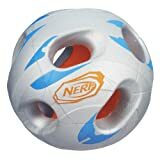 And since it’s Nerf, you can play just about anywhere. Simply hook the slick, oversized backboard to a door, and you’ve got game! The hoop measures about 9 1/2-inches in diameter, and the backboard style is subject to change. Ages 4 and up. Note: Backboard graphics may vary. Play a game of hoops almost anywhere you want! 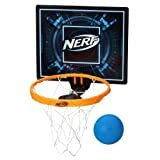 Hang your durable, high performance NERFOOP backboard, hoop and net on a door or wall and then get your game on with the mini basketball. The NERFOOP backboard and hoop are built for instant action whether you’re indoors or out! Challenge your friends, show off your skill and make those 3-pointers anywhere, even right in your own room! Blast, blast, blast! Keep your blaster loaded and ready to fire. Never run out of ammo again! Blast away to your heart’s content! 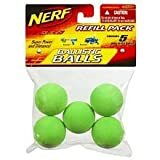 Keep your Nerf Reactor or Buzzsaw Ball Blaster loaded and ready to fire with this handy refill pack of 5 Ballistic Balls. Never run out of ammo again! Ages 6 and up. Batteries not required. Blast, blast, blast! Keep your blaster loaded and ready to fire. Never run out of ammo again! Blast away to your heart’s content! 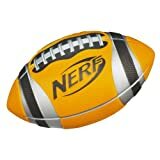 Keep your Nerf Reactor or Buzzsaw Ball Blaster loaded and ready to fire with this handy refill pack of 5 Ballistic Balls. Never run out of ammo again! Blasters sold separately. Ages 6 and up. Batteries not required. Hit the “gridiron,” or your backyard, and play at your A game with this classic football! Featuring Pro Grip texture technology, this football helps you throw your best spirals and catch like a pro. Huddle up, plan your plays and get your scrimmage going! Massive water capacity! Pump and blast! Pump and blast! Your neighborhood will fear you with the handy Soaker Wars Hyrdro Fury blaster. This Hydro Fury holds up to 5.5FL.Oz./165ML and can shoot 16ft./4.8m far! This stealth size Super Soaker can be easily concealed for suprise attacks! Ages 6 and up. Colors may vary. We cannot accept requests for specific colors at this time. Massive water capacity! Pump and blast!Pump and blast! 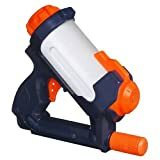 Your neighborhood will fear you with the handy Soaker Wars Hyrdro Fury blaster. This Hydro Fury holds up to 5.5FL.Oz./165ML and can shoot 16ft./4.8m far! This stealth size Super Soaker can be easily concealed for suprise attacks! Ages 6 and up. Colors may vary. We cannot accept requests for specific colors at this time. Measure about 8-inches long.